Reeves, a native of Lubbock, Texas was a star quarterback at Texas Tech from 1978 to 1981. He left the university as the career leader in passing yards, touchdowns and completions. By coincidence, Reeves was from the same town as earlier Montreal QB Joe Barnes and broke many of Barnes marks at Texas Tech. Reeves was inducted into the school’s hall of fame in 2007. He played briefly with the Oilers and in the USFL with the Chicago Blitz. After being released by the Oilers after the second game of the 1982 NFL season, Reeves looked to the CFL . 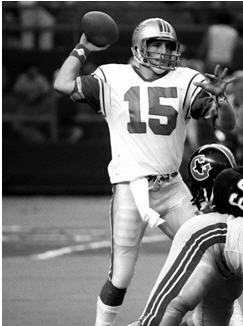 He signed with the Stampeders for the 1983 season, but was released by Calgary as they had two other strong rookie quarterbacks in Danny Barrett and Bernard Quarles. Reeves was picked up by the Concordes in late June of 1983, one week prior to the start of the season as emergency insurance. Johnny Evans had been the Concordes' scheduled starting quarterback, but he was out with a broken collarbone. John Rogan had taken over the #1 spot and started the opening game, but Montreal coach Joe Galat was not satisfied with his backups - Canadian Luc Tousignant, who had strarted much of 1982 and rookie Mike Calhoun. Reeves came on in relief of Rogan in the first game of the season and that earned him the start in the following week. Reeves led the Concordes to their first victory on July 16th, tossing four TD passes in a come from behind victory over Ottawa. However, a 23 year old rookie leading the weakest team in the league was a doomed concept. In September he was released by the Concordes when Evans returned. In 1984 Reeves played with the USFL Chicago Blitz as a backup QB to Vince Evans, under head coach Marv Levy. Ron Reeves is currently a home builder in Lubbock.